Nonlinear optics (NLO) describes the behavior of light in nonlinear media, where the response intensity of the medium does not depend linearly upon the intensity of the incident light. For example, twice the optical input intensity does not simply result in twice the output intensities. The nonlinear optical response of a material is generally very weak, however at high powers, the material properties can change more rapidly. Therefore, a nonlinear effect can be achieved with high intensity lasers, since the nonlinearity also implies a super-linear dependence on the intensity of the light. Currently, non-linear optical interactions are generally based on large crystals that gradually accumulate a strong effect. NLO phenomena have been observed in a wide range of wavelengths starting from the deep infrared to extreme ultraviolet. The impact of NLO on science is widely understood nowadays, as it has enabled at least nine Nobel prizes in physics and chemistry. NLO has caused many developments in our daily life, with broad applications in laser-materials interactions, information technology, sensing, communications, data processing, etc. In this paper, the latest advances in obtaining efficient nonlinear signals from tailored nanostructures, whose thicknesses are typically a few-hundred times less than a human hair, are reviewed. 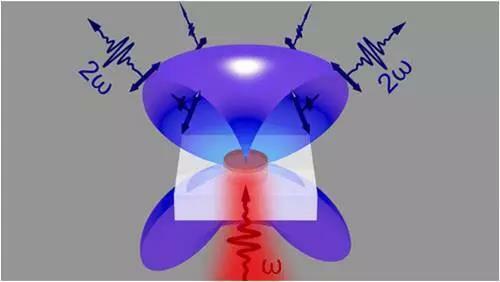 In the last decade, several research groups, whose heads and members are the co-authors of this review paper, have contributed significantly to develop nonlinear nanoantennas that strongly interact with the incoming light to transform its frequency, radiation, and polarization patterns. Co-authors of this paper and many other groups worldwide have demonstrated numerous approaches to artificially induce nonlinear responses in ultra-thin nanostructures, including metallic, dielectric and semiconductor nanoantennas. However, after more than a decade intensive research, metallic nanostructures have been almost abandoned due to nonradiative Ohmic losses. On the other hand, high-index nanoantennas, fabricated out of silicon and germanium, have shown to overcome this challenge because of their negligible losses and their ability to exhibit Mie-type resonances. However, the centrosymmetric structure of silicon and the lack of quadratic nonlinearity, has guided the research towards exploiting semiconductor nanostructures, particularly III-V semiconductors. In the evolution of nonlinear frequency conversion by optical nanoantennas with various materials, nanofabrication difficulties have been always the main obstacle to be addressed. Employing new materials with minimal optical losses and maximal nonlinear properties, as well as reasonable resistant against heat generated by high-power lasers, is always accompanied with requirements for developing new fabrication techniques. In this paper, the materials evolution and various approaches for fabricating nanostructured materials for nonlinear frequency conversion are reviewed. Detailed explanations of the advantages and disadvantages of each material, in terms of nonlinear properties and nanofabrication techniques are provided in this review.